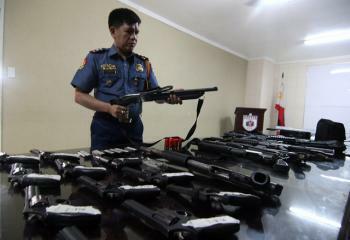 Of the 1.7 million licensed firearms in the country, 60 to 70 percent were issued based on fake documents, the Philippine National Police said Friday. Citing figures from the PNP Firearms Explosives Office, Police Chief Superintendent Louie Oppus said in a report on “24 Oras” aired Friday evening that he has ordered the investigation into the use of fake names and addresses as well as fake neuro-psychiatric results by applicants. “I have now caused an investigation into those neuro-psychiatric results na parang peke… Biruin mo, mga limang tao, magkakapareho ang resulta ng neuro remarks? May posibilidad ba ‘yun?” he said in the report. He said the PNP hopes the recently signed Comprehensive Firearms and Ammunition Regulation Act would give gun control teeth. Signed by President Benigno Aquino III in May 2013, the law seeks to regulate the registration and ownership of firearms and ammunition by requiring gun owners to renew their licenses every two years. The new law supersedes Executive Order 194, signed by President Joseph Estrada in 2000, which removed a limit on the number of guns a person can own. Before EO 194, owners were only allowed to have 10 guns. The report said that under the new law, the PNP itself will administer neuro-psychiatric and drug tests. Gun owners will also be required to apply for licenses to own firearms before they can register their guns, and firearms will be automatically considered illegal if their licenses are not renewed within a day of expiration. Automatic weapons, once licensed, cannot be resold or passed on to another gun owner, the report said.”The new law now registers the person or licenses the person [and] at the same time licenses all the firearms [owned by that person]. Under the old law, you are not registering the person, you are registering the firearm,” Oppus said. Stricter requirements under the new law drew mixed reactions from the firearms industry. “It will have an impact of the business side because there will be additional steps. Then again, we do not know what those specific steps are,” said Rhone Malcolm De Leon, operations manager of Shooters Gun and Ammo Corp. in the report. “Siyempre, primarily sa negosyo namin as a private diagnostic center, hindi kami kikita. Pero mas magkakaroon ng sistema,” added a source from a diagnostic center who refused to be identified. Calls for stricter gun control increased last year following the death of seven-year-old Stephanie Nicole Ella from a stray bullet on New Year’s Eve leading up to 2013. During the New Year revelry leading to 2014, three-month-old Von Alexander Llagas from Caoayan, Ilocos Sur, and two-year-old Rhauz Angelo Corpuz from San Nicolas, Ilocos Norte were killed by stray bullets that penetrated the roofs of their homes. At least 28 were victims of stray bullets during the recent New Year celebrations, according to the Philippine National Police (PNP). Fifteen individuals, meanwhile, have been arrested for indiscriminate firing, the PNP said.